As I approached the bird, I could see that he was missing an eye. 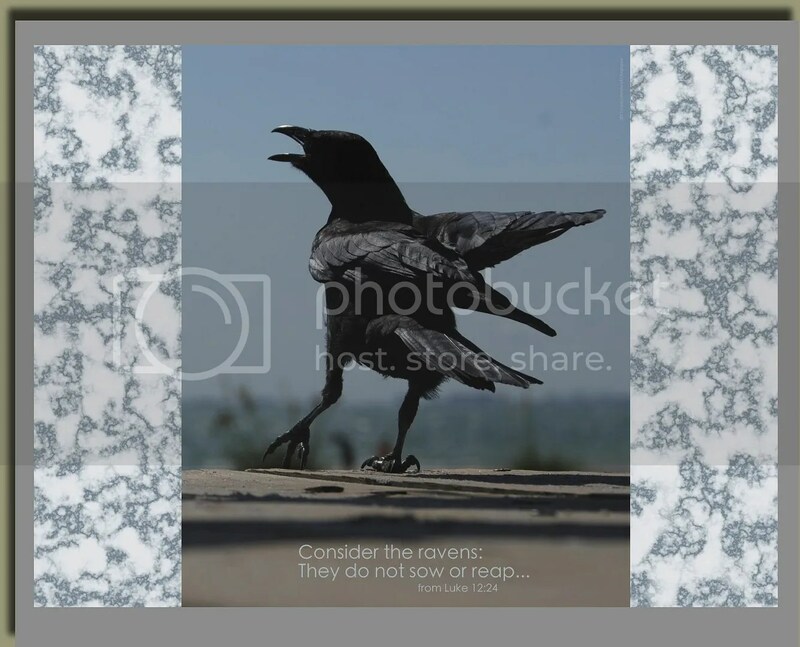 Snowy white, he sat perched and quiet. He knew I was there. Turning his head to the side as if to listen more closely, his movement told me that he was aware of my presence. Feeling compassion over the loss of his eye, I immediately wanted to check to see if he had one on the other side. A couple of steps past him and I had an answer. I looked at him— and with his one, perfectly dark and round eye—he looked at me. King David pondered over the presence of God in his life. He understood that He was always with him. What was true for King David is also true for us. Even when we cannot see God, He allows us to become aware of His presence. At specific moments, we may turn our heads to the side to listen carefully, perceiving that He is near. Whether we feel Him close or not, He is with us, still. Nothing can separate us from God. So great is His power, the night shines as bright …..as day. The old lighthouse is still standing. It was first lit in August of 1884. Giving light to those traveling near in the Atlantic waters, it became an important guide to those who sought it. As I was taking photographs of the lighthouse, a woman stood not far from me doing the same. From where she stood, the lighthouse took on a different look. As I approached the area where she had been standing, I understood why she had chosen that spot. The sun was high in the sky, directly behind the top of the tall structure. Diffused light encircled it, surrounding it with a distinctive glow. When looking at the photos I took at that moment, my mind is drawn to the light surrounding it. I’m not sure that I could look at them without thinking of the light emanating from around it. When my family and friends look at me, do they see a light shining? Does what I say and do work together to draw their thoughts to the light? 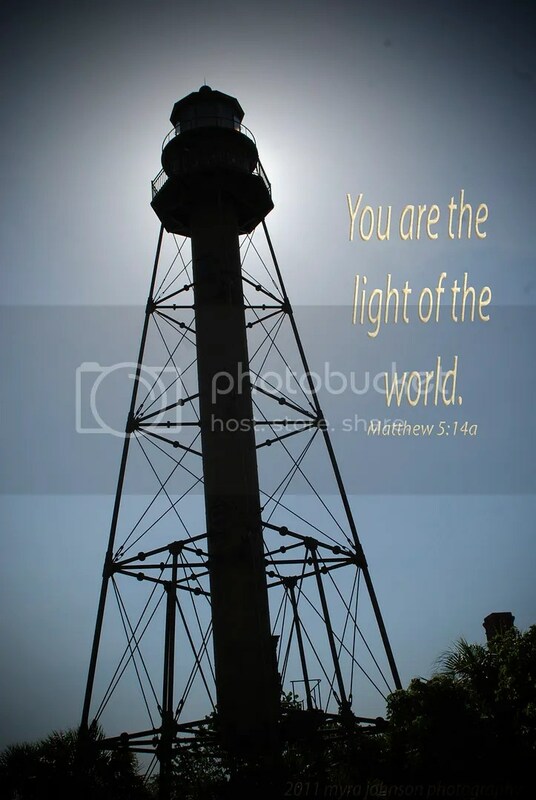 Is there a distinctive glow about me that allows them to see God in my life? I knew what it felt like to be in the rain. Just last week, a fierce downpour of rain came along while I was a passenger in a car. Even though it was raining heavily, I was safe inside and quite dry. This afternoon as I was returning from the grocery store, it was raining. As I drove down the highway, I spotted a young couple walking on the side of the road. They surely were drenched. I passed them and headed toward my home. As I drove, my mind was busy. Only yesterday, I had felt an impression to strike up a conversation with someone in the waiting room of a doctor’s office and had not done so. Was God telling me to do it? I probably missed a great opportunity to be a witness for Him. Now, I had just passed two people walking in the rain. Suddenly, I became aware of the song that was playing on the radio. It was a Christian song about not waiting but doing what God wanted you to do…. Already in my neighborhood, I turned around in someone’s driveway and headed back down the road. There they were, still walking. I pulled over and when they got closer, I asked them if they needed a ride. Grateful and polite, they were not too far down the highway from their destination. I explained a little about the song I had been listening to and how I was prompted to offer them a ride. It was a great opportunity to show God’s love to two strangers in the rain. I’m glad I didn’t miss it this time. Do you worry about what other people are going to do? It is a difficult concept to "turn off" worry. Worry walks behind a banner in the parade of stolen moments. The banner reads, "What if…?" When something is of great concern to you, God knows about how you are feeling. Take the turmoil in your heart to Him and pray about it. Ask Him to lead you to a place in scripture that will help you to begin thinking about the situation in the way He wants you to. Ask Him to calm your fears. Pray for the people who are involved in the matter. Don’t waste time hurting and worrying. Invest your time in consultation with the One who is in control. All by myself, without God, I _________________. Before you try, let me warn you—-it’s very difficult. Just a few days ago, I saw someone parasailing. A parachute is tethered to a boat by a very long cord. Through the power of the boat, the parachute is lifted with it’s passenger (called a paracsender) high above the water to glide in the air at great speeds. The parascender has very little or no control. Without the power at the end of the cord, the parachute would cease to travel. 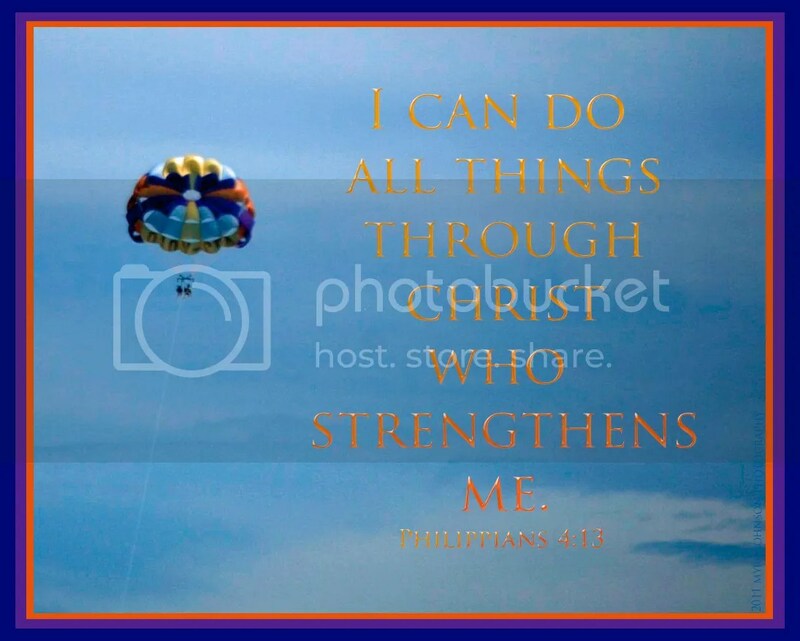 I have never been parasailing. Let’s look at some of the things I have done, however. I have developed a career. I have learned to play musical instruments. I have made good friends. But wait….can I put any of those in the blank? All by myself? 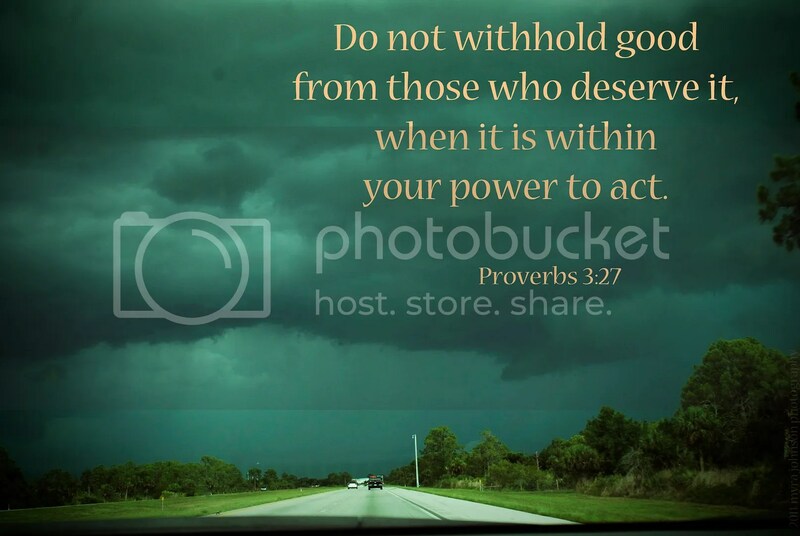 Without God? It was He who provided the funds for me to go to college when I was living with a single mom and my dad was no longer living. It was He who provided the various jobs I have had throughout the years, guiding me to any success that I enjoyed. It was He who blessed us with four healthy babies, even through very difficult pregnancies. It was He who provided me with instruments to practice and the talent to develop skill on each one. It was He who gave me my voice—He chose it for me! It was He who placed the desire to photograph His world in my heart. It is He who gives me words to express my thoughts. It is He who has brought good friends into my life. No matter what good thing I could choose to write in the blank, it would be in error, because it would originate with God. Even the very breath that I take originates with Him, as does the tiniest cell in the muscle of my beating heart. If I am not connected to Him, I cease to exist. Imagine yourself as a parascender of life. Throughout everything, you are connected to God, who strengthens you and lifts you up. Now…..what could you write in the blank? We got up early this morning. Our youngest son had been away at a Christian summer camp for several days. It was time to make the trip to pick him up and bring him home. Parents were invited to attend the last worship service the students take part in before they say their final goodbyes and leave the camp. We were able to experience a little of what had gone on all week. Afterwards, I photographed some of the camp areas. 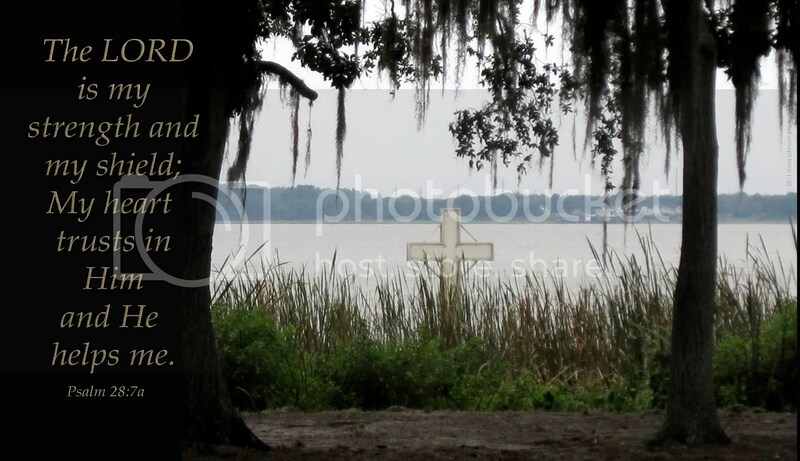 There was a white cross located by a lake on the grounds. I would think that it reminds all who see it of Jesus. Hundreds of students left the camp today. Hundreds more will replace them for next week’s camp and the next. Countless lives will be touched in some way by the commitments made during these days. I am certain that God met many of the young men and women there and spoke deep within their hearts. In the moments and hours, separated from the day to day madness of the outside world, their ears were more keenly aware of God’s voice. They surely found new strength to face the difficulties they have been struggling with. New hope certainly sprang up with the promise of God’s help. This has been my experience when I have been to camp. It’s a good thing to get away and focus on God while encouraging each other in the faith. We may not have a week to set apart to do so, but even a small amount of time is beneficial. Couldn’t we just invite some friends over for the day, play some games and end with some praise and worship time and a devotional? I think God would meet us there…. They were quietly swimming beside the shore. I’m not sure that I could even hear a sound from them. The ducks were safely carrying on the life that God had planned. They were God’s creation, glorifying Him with their presence in this world. God blessed us with four children. Knowing that each one has asked Jesus to be their Savior is the greatest blessing I could ever hope for concerning them. One of our children has gone on to be with the Lord. I have spoken many prayers about each child throughout the years, but none would compare to those about their eternal destination. I encourage you to pray for your children. They may be quietly carrying on their lives, but do they know Jesus? This was quite a day for yard work. Driving home from the store after purchasing some red mulch, we passed a marquee on the highway displaying the current temperature—103 degrees. I think it was almost 5:30. Isn’t it supposed to be cooler when the sun is going down? Earlier today, I had pulled up some weeds in preparation for planting flower seeds. There were several of the same type of weed occupying the garden space near our front door. Wearing thick gloves, I would pull very hard with one hand and some of them would come up out of the ground. Others, more stubborn than their neighbors, would hang on and defy me. With BOTH hands, I would pull and pull until FINALLY, the plant would come up, roots and all. That was the key word for the situation. The roots were extrememly long and deep to support the foliage above the ground. I put a few of them on a bench. After coming home with the mulch, I realized that the weeds I had pulled were beginning to shrivel. They were losing their strength and would soon be dry and brittle. I know for certain that I have hurt because of sin in my life. I also know for certain that I have hurt because of sin in others’ lives. 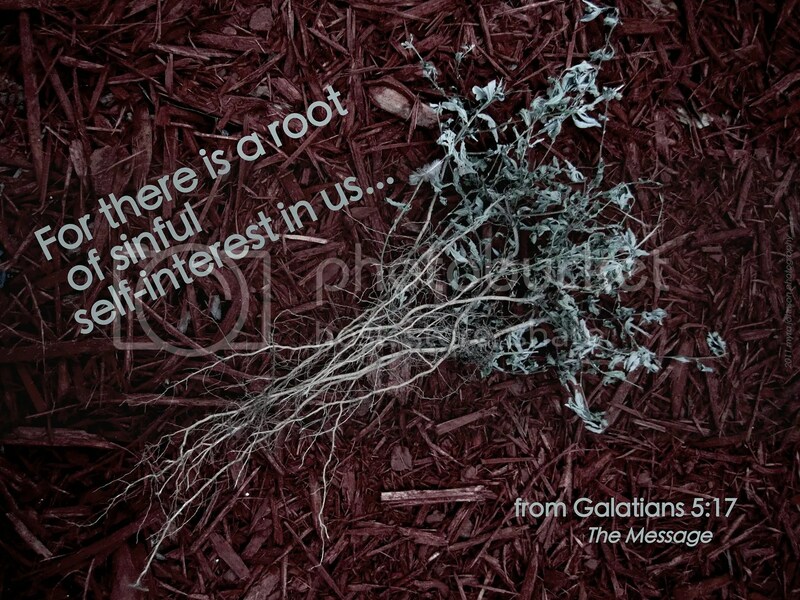 When sin takes root within us, it begins its pathway deep into who we are. It feeds the outward result into thriving, green foliage, no matter how ugly or unwanted. Getting rid of it isn’t easy, either. In fact, it is impossible for us. We try to tug with our human hands, but to no avail. 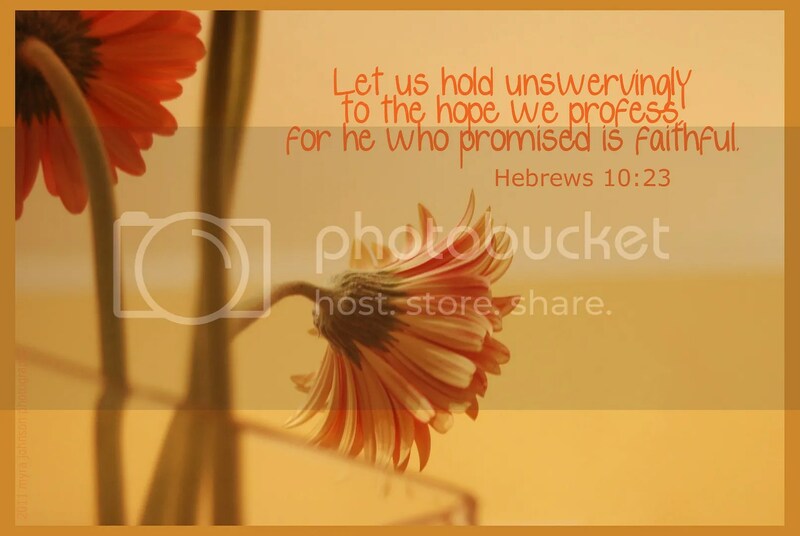 It takes the hand of God to grab hold and pull it out. When it is removed from us and laid aside, it cannot thrive on its own. It withers. It dies. It is no longer a part of us. With God, there is forgiveness of sin and freedom from the roots of those things that displease Him. It doesn’t matter what time of day or night. It doesn’t matter what the temperature is. God is ready to pull the roots of sin. Are you ready to let Him? Driving to a birthday party for a dear friend, we reached our destination to a nearby city. As we made a loop around a quiet lake, I made a quick decision to photograph it. The serenity in the midst of the hurry here, hurry there atmosphere of the downtown area is a welcome change to those who frequent the area, I’m sure. The fountains streaming upward, the multi-story building and the family dwellings in the distance made for quite an appealing sight. Although captivating, none of these things really matter, do they? Many people will spend their lives persuing the means to finance a company large enough to grace the skyline of a major city. Others will spend their lives trying to build their career to a point where a large and spacious home can be purchased. Architects may look on their creative landscaping and feel the pleasure of a project well done. Not if, at the heart of all these, they have forgotten God. I know someone personally who believes that there is no God. They are doing very well financially, yet they are very poor spiritually. I know someone personally who has great faith in God. They are struggling financially, yet they are very rich spiritually. 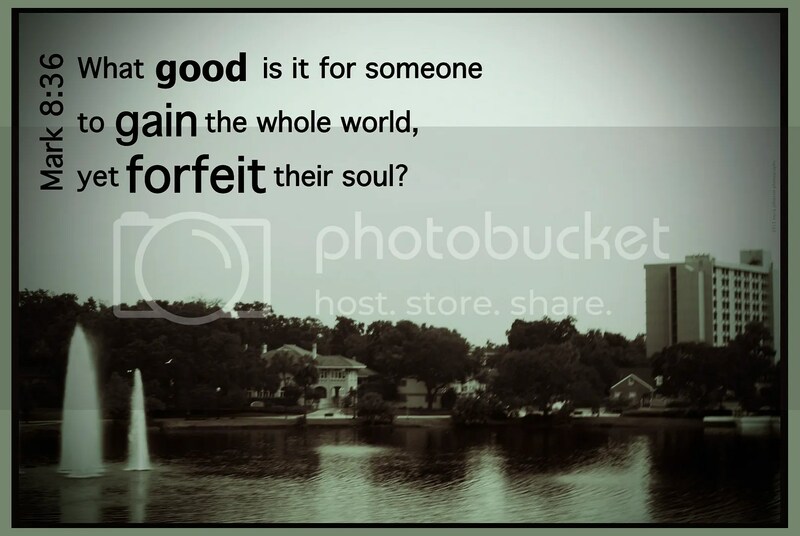 What good is the whole world? It is of no worth at all…..
when compared to the precious saving knowledge of Jesus. I didn’t know who they were. As I was taking a walk with my husband by the lake, they were up ahead of us, fishing. Huddled together, they had a common goal—catching fish. Although it is the summer of 2011, the same scene could have been captured 50 years ago with little change. In fact, the same scene could have been captured 100 years ago with very little change. Fathers and mothers, brothers and sisters, uncles, aunts and cousins have grouped together to enjoy each other’s company and catch a little fish while doing so for centuries. Time spent together is more than just time. It is the avenue of transference of skill, faith, wisdom and character. How can anyone emulate those they are not familiar with? Today, our youngest son wrote a note to his Dad for Father’s Day. Within the note were the words, "We need to go fishing again, soon." An invitation of time. He did not say, "I need to learn your skill" or "I need to learn about your faith" or "help me to be wise" or "what kind of character should I have?" He didn’t need to. These are the types of things that naturally begin to happen when moments are shared together. "We need to go fishing again, soon" was good enough. 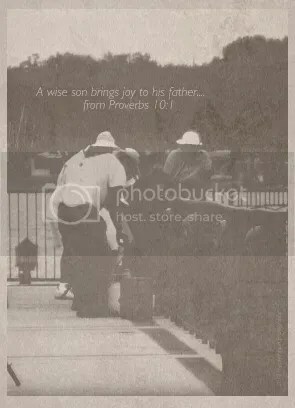 There must be great joy when a father can look at his son and see the fruit of the time they have spent together. Have you gone fishing with anyone lately? Maybe it’s time to go……. 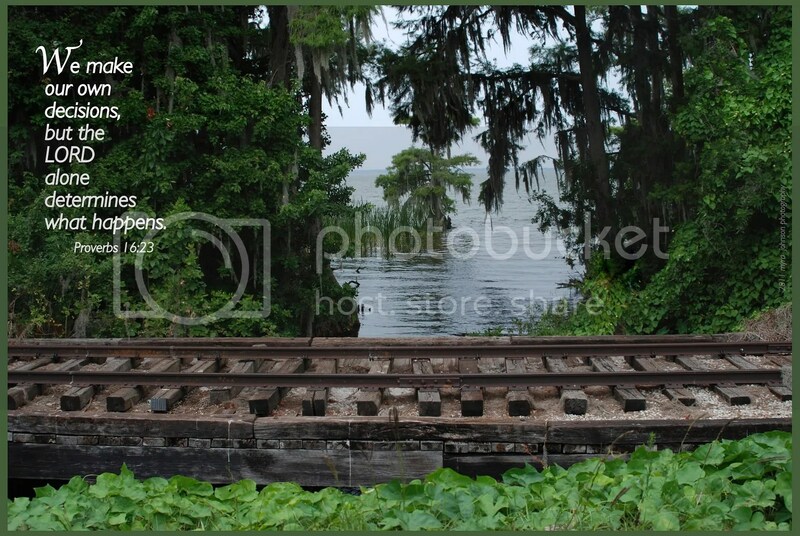 Should I go by train? Should I go by boat? Should I do this at all? Someone I know recently commented that they were their "own worst enemy." Second guessing ourselves, trying to make the right choices and decisions—sometimes we fail miserably. 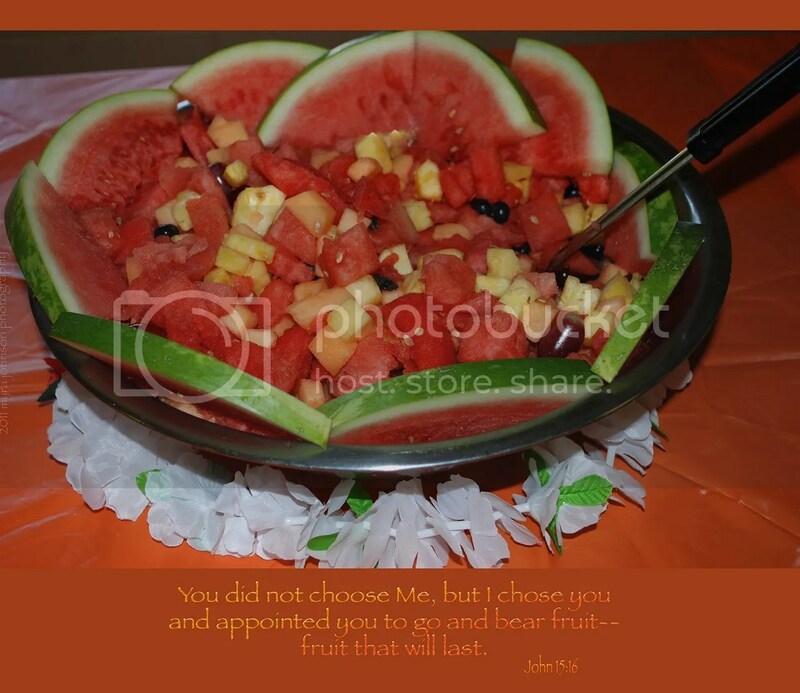 We do make our own choices, but God is still sovereign. When we do fail and make a poor decision, it is important to turn right around and run back to God. For the next choice, ask Him what you should do–or perhaps, what you shouldn’t do. I have two Crepe Myrtle trees in my yard. The flowers on the oldest tree are a delicate pink color. The younger tree produces a bright pink blossom, deep and rich. Although I do not own a white flowering Crepe Myrtle tree, they are quite common in our area. Recently, I photographed the pure, white blooms of such a tree while walking in a park. 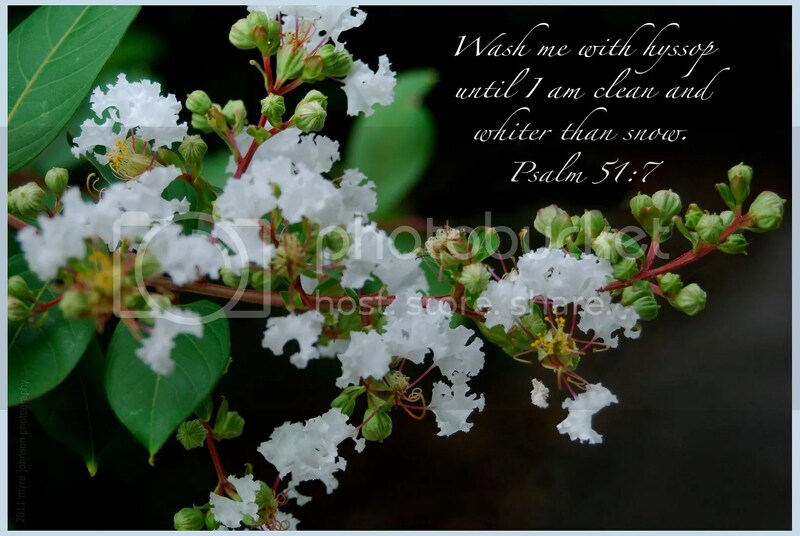 I have read that there is a small bush with white flowers called hyssop, and that it was sometimes referred to as a symbol for being cleansed from sin. Another source that I found spoke of the use of hyssop in the treatment of illnesses. Although I have never seen a white hyssop bush, I can imagine how the white blossoms reminded earlier generations of purity and freedom from sin. Whatever white flower we may be looking at, the symbolism of purity can be present. We long for forgiveness and the knowledge of being clean before God. Isn’t it wonderful that God can make us clean? The flowers on the oldest tree are a delicate pink color. The younger tree produces a bright pink, deep and rich. I have read that there is a small bush with white flowers called hyssop. Today, the lesson for me was huge. The kind of thing that remains in your memory. My husband and I had decided to trim large limbs from a tree in our back yard. After cutting several limbs with the loud and threatening chain saw, we were discussing which limb should go next. As I looked very close to where I was standing, there–on a low branch—sat a silent dove. Almost motionless, except for the quick blink of her dark, determined eyes. The giant monster with the loud growl was destroying what she knew as her home. It could come and get her, too—-but she was NOT—repeat—NOT leaving her babies. Were they only eggs? We heard no baby bird sounds. Leaving our tree somewhat lopsided, we continued cutting limbs that were far from our momma bird and her precious children. The limb could stay as long as she needed it to. Throughout the rest of the loud cutting, she remained. I prayed that God would tell her that we were not going to hurt her or her children. Even though I knew she couldn’t understand me unless God allowed her to, I approached her and spoke aloud the sentiments of my previous prayer. Hours later, my husband brought a ladder outside for me. I climbed it in order to be on a little higher level than the nest. Our little momma would move away for a few moments, then return. I was able to photograph what was worth dying for—not eggs, but tiny little babies–huddled in a nest– so lovingly constructed, one twig at a time. Who placed such devotion into the heart of a dove? Who places it into the hearts of human parents who are completely devoted against all odds? God is the creator of love. His love is pure and holy. He gives us the ability to love in the midst of our frailty. He places the capacity to love within our hearts and from His love, we draw our love. Would we abandon our children? Even when the big growl of destruction is all around? 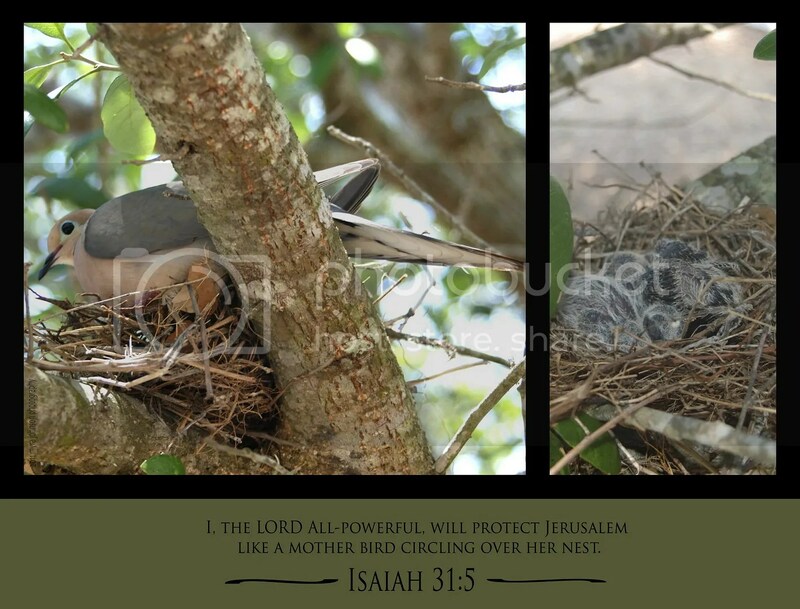 The vision of this determined, loving mother, sitting on top of her children in the nest, speaks volumes to me. Her babies were not even aware of the danger, yet she could see it plainly. When the danger was at it’s worst, she stayed. Even when the danger is at it’s worst in our lives, God will not leave us. 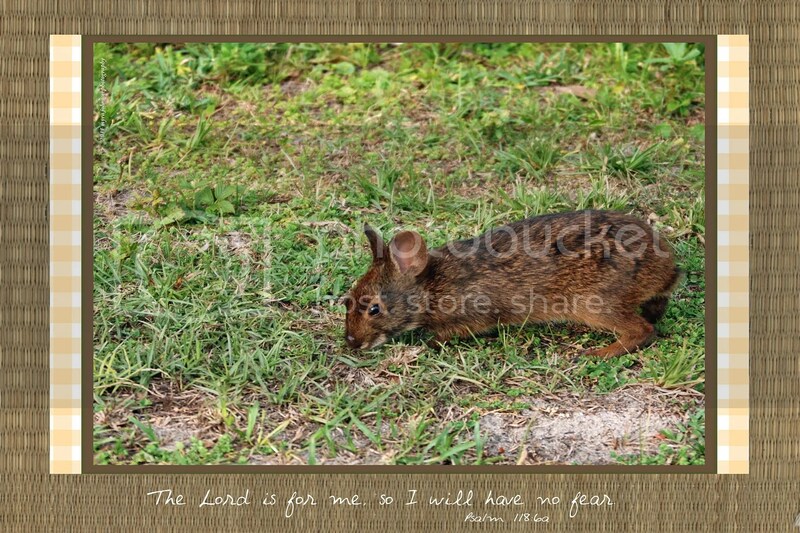 The wild rabbit was searching for food near the sidewalk. Close to his precious brush, where he could hop if any danger arose, he seemed quite content to go about his business as I crept closer and closer with my camera. He simply did not regard me as something to be feared. He must have decided that, if he needed to, he could hop into the brush faster than I could run. Sometimes unfamiliar things invade our comfortable space. We just want to go about our business doing whatever we please, and then, well, something changes. Something or someone shows up and then we have to make a decision. 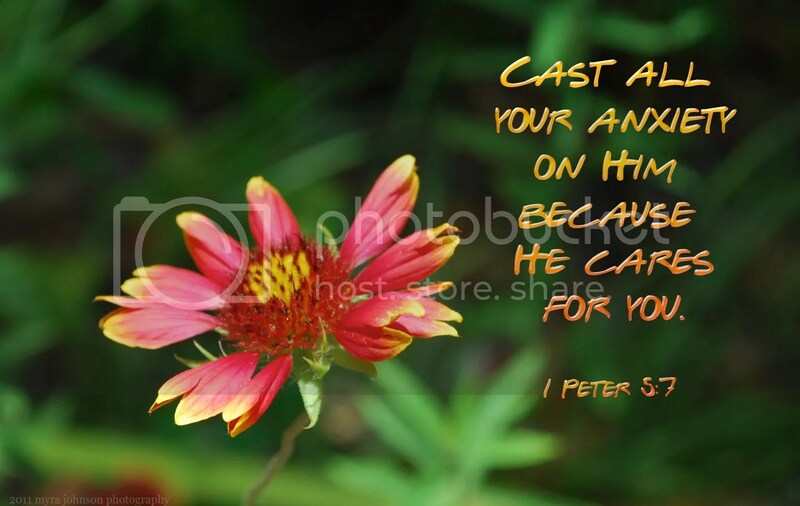 Are we to be afraid, or will God take care of us? Has God really provided the nearby brush and the ability to hop if we need to? The following is actually, absolutely true for me right now. I’m guessing that most, if not all, will be true for you right now, as well. I know someone who is grieving the loss of their spouse. I know someone who is looking for a full time job and is now out of work. I know someone who is struggling emotionally. I know a couple who are often seriously at odds with one another. I have a friend who got divorced today. I know someone who is an atheist. I know someone who says they are an agnostic. I know someone who is battling cancer. I have a friend who is grieving the loss of his mother. I have a friend who is sad most of the time. I have a friend who has a child who is chronically ill. I have a friend who does not read the Bible. I have a friend who does not attend church at all. Even though I would want to help each of the tender hearts represented above, I am limited. There are ways that I can help. There are also many ways that I cannot help. 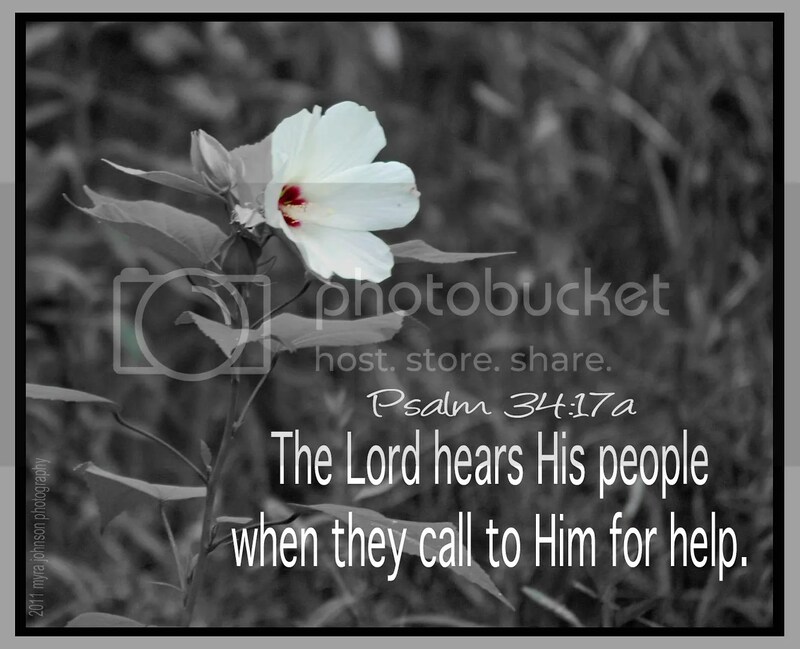 The help that all my friends need is ultimately from the Lord. Am I pointing them to Him? A simple replica of a windmill stood near the rustic museum. Through the ages, men have tried to harness the wind and use its power. Sails have billowed as ships have challenged the sea. Windmills functioned in milling grain or pumping water. Through the ages, men have tried to harness something very real–yet invisable. We have grown so used to the idea of the unseen wind. It moves as God directs it to. Only He has the power to harness it. Do you have anything in your life that needs to be harnessed by God? Is it something that is very real, yet invisable to others? God can replace fear with peace. Low self-esteem with the realization of who we are in Christ. 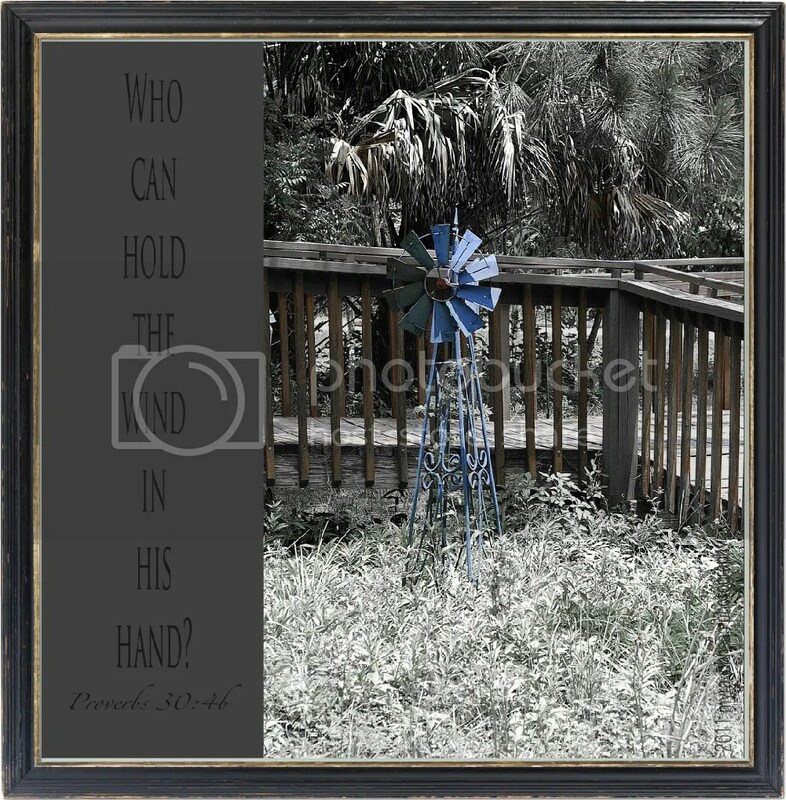 God can hold the wind in His hand. "Every word of God is true. 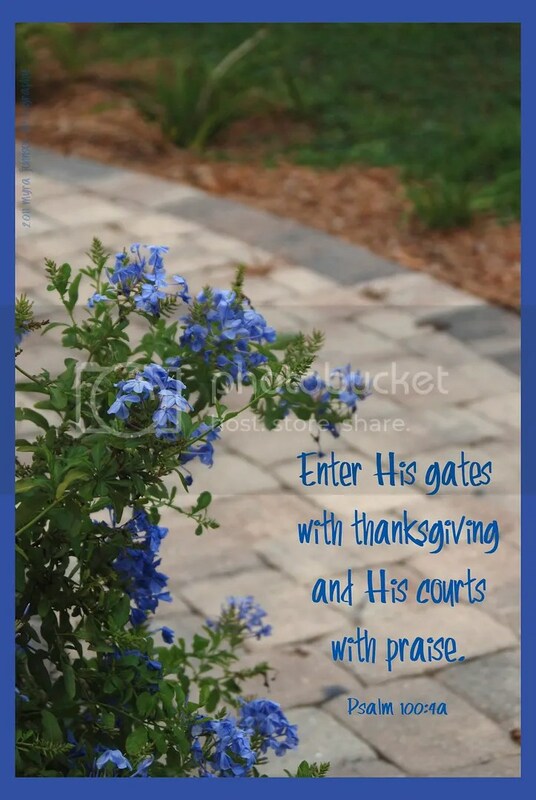 He guards those who come to him for safety." Our son was leaving to visit the nature preserve area near our home. I was in the kitchen when I heard him call to me. 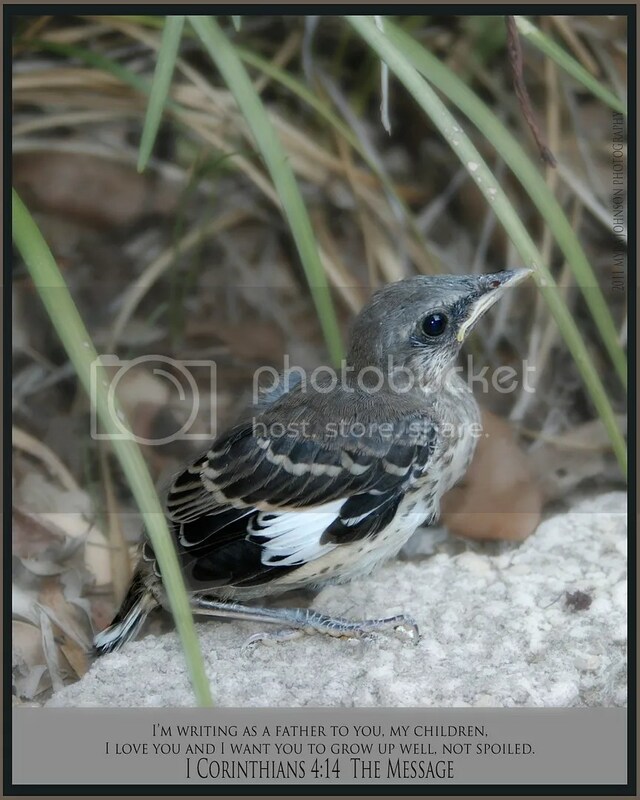 A baby bird was sitting near our front porch by the sidewalk. Sweet and innocent, he looked at me with his clear, black eyes. After a couple of photographs, he decided to run away—peeping loudly. We could hear the parent birds calling, as well. They were greatly concerned about their little one. Flying to the branches high above where the tiny bird hopped, they continued to be very vocal. Immediately, I began to think, "I understand." Being a parent, one of my strongest desires is to know that my children are doing well. Beyond the physical, my concern and desire for their walk with God is paramount. When they are ready for the next phase in life, whatever that may be at the moment, I am not too far away. As walking gives way to flight, I am somewhere close in the distance, ready to call when I see danger approaching. "It’s okay! Stop worrying about me! I can do this! Just leave me alone!" Perhaps his high pitched peeps were exactly that—but I will never know. Although Paul was not their biological father, he loved them and wanted what was best. Throughout my children’s lives, I have taken the time and effort to help them grow up spiritually. As God has blessed us with children, we have a responsibility to share our faith with them. "God is with you! You can do it! Always trust in Him!" Isn’t it worth the time and effort? This morning, my husband and I decided to visit a park. Being very natural and rustic, the area is also a popular fishing spot as it borders a large lake. We hadn’t been there long when a hawk began to call. I decided to take a closer look, camera in hand. The hawk was beautiful and stately and yet, a little miffed at my presence. 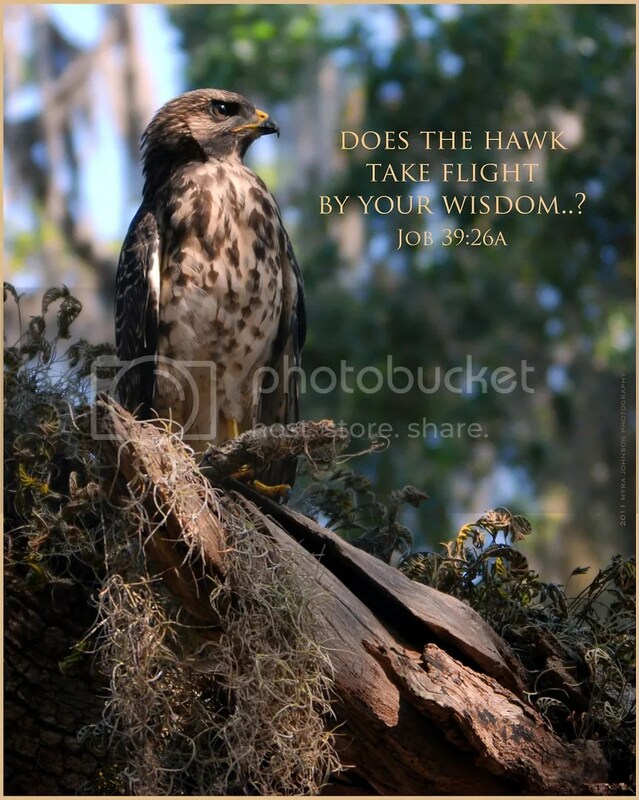 God made him, gave him his perfectly arranged colors of feathers and equipped him with everything he needed to be in order to be a….hawk. God is reminding me that I must trust His sovereignty. Even when I am confused. Even when I am afraid. Even when I am unsure of what to do. It was long ago when I heard this set of questions. So long ago that I don’t even remember how I heard it. It is a series of questions without answers. Those who hear may only respond, because no one can decide the final question for them. What do you plan to do when you finish high school? An entire adult life—-ten questions…..
the last question being the most important one to answer. Whatever you may do in the years you are given, what you decide about Jesus is the most important thing. Go ahead—why don’t you answer the questions for yourself? Would it be like God to send you in the wrong direction? Would He ever tell you to do something that wasn’t in keeping with His great love for you? Would He lead you down the wrong path, keeping you from what was best? Even when life is confusing, we can trust God’s directions. 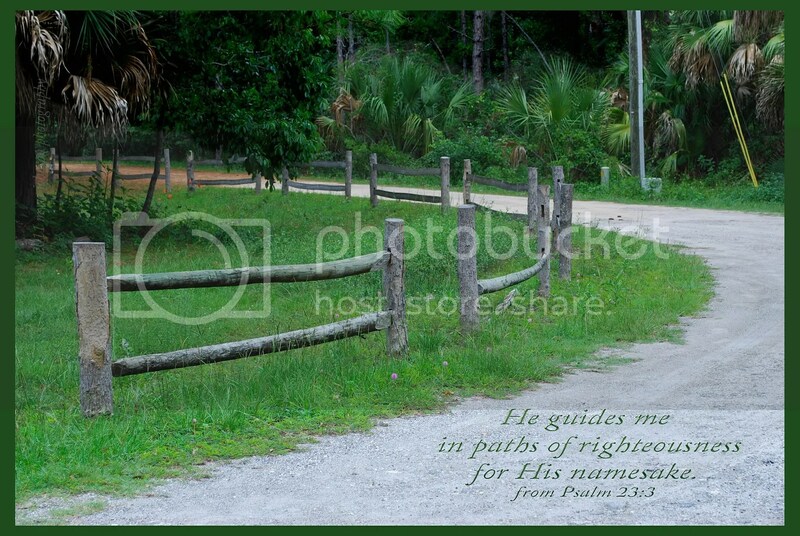 He knows what lies ahead on the path. The water that brushed quietly against the plants that grew along the shore was calm and peaceful. Enormously tall clouds danced gracefully in the wind above, the sun spotlighting their performance. This is not always the scene. On other evenings, the rage of a storm can be found, chopping the water and bending tree branches. It is God who rules over the skies. When there is a storm, it is He who calms it to a whisper. 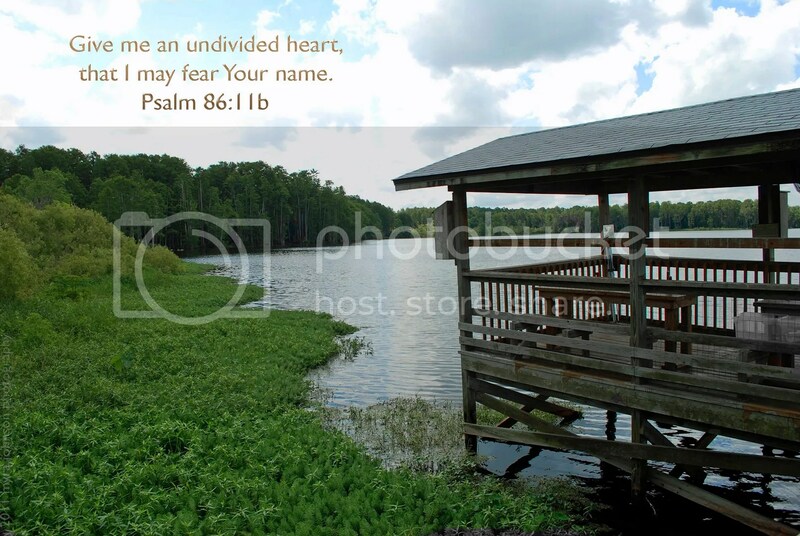 Are you sitting beside the peaceful waters today, enjoying the cool breezes or are you in the midst of a storm? Wherever you are right now, God is with you. 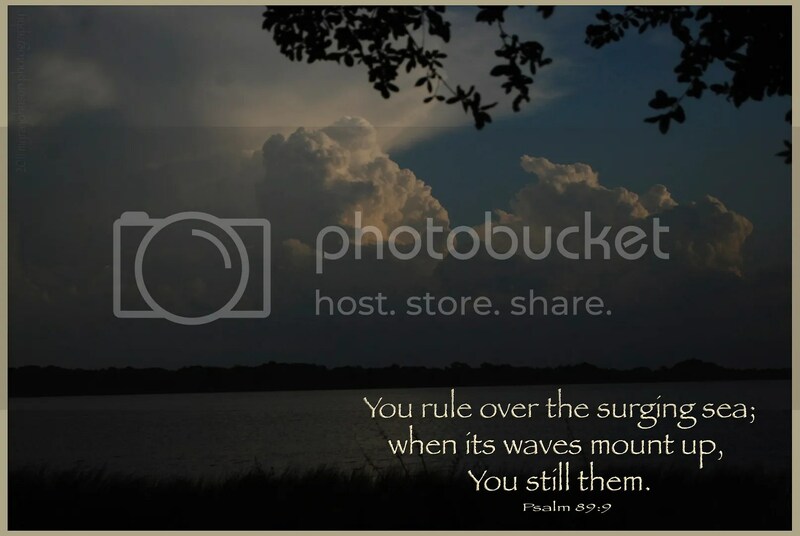 If the waves are mounting up, remember….God has the power to still them. There is a popular Christian song that God has used to inspire me, comfort me and break my heart in joy more than once. So strong was the message to me this morning on the way to church that tears were coming to my eyes. When viewing a piece of artwork—a painting or a sculpture—each person forms a unique understanding to what the art represents. When listening to music and lyrics, I feel that it is much the same. 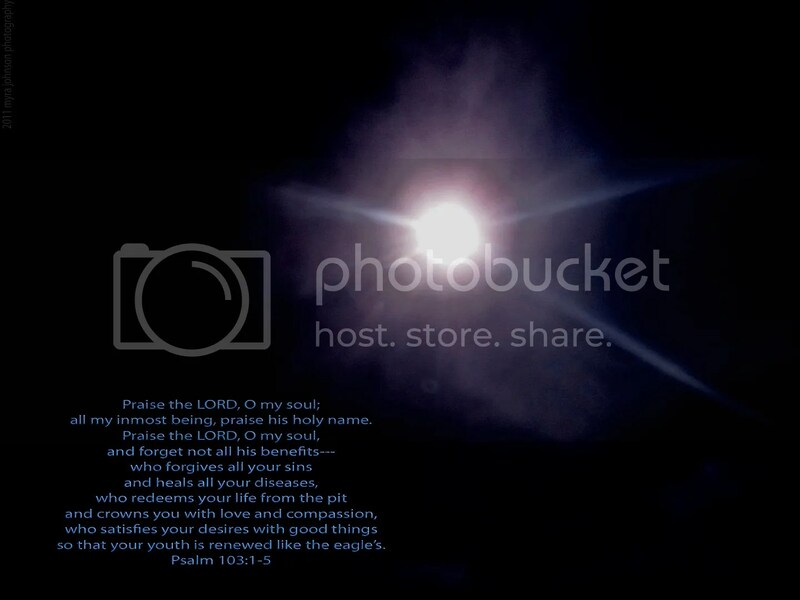 Going a step further, I feel that God can use visual art or music to touch our hearts, over and over again. The song, "I’m Alive Again" by Matt Maher, traveled to my ears this morning by way of my mp3 player and car stereo. I hadn’t expected to "hear" what God would reveal. I think that the words were originally intended to portray an individual’s coming to the saving knowledge of Jesus. I was feeling something different. Imagine this being the words of a believer in Jesus as they are experiencing death on this earth. As darkness and silence begins to close in, they are questioning…"Where have I gone?" The reality of earth and all that is here in our physical realm, begins to lose its grip on this precious one. Quickly–suddenly—they see the LIGHT! It is not the sunrise; no, it is God! 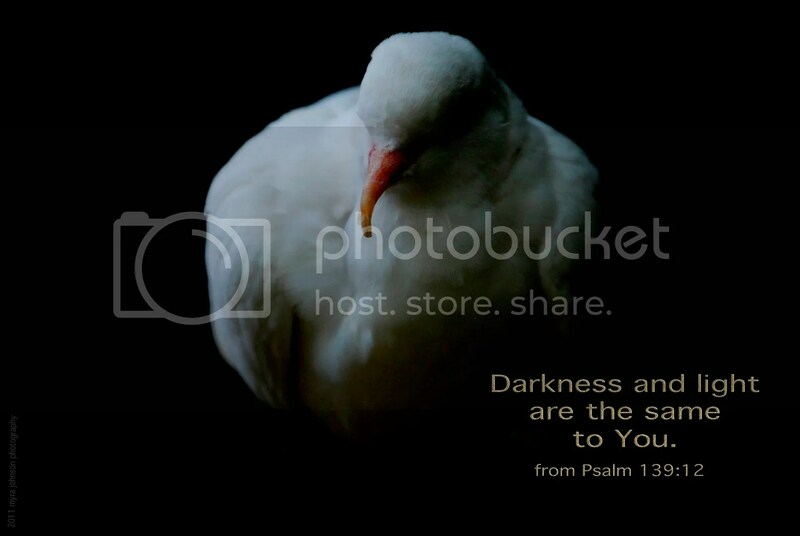 God SHATTERS the DARKNESS of death! He WASHES AWAY death’s BLINDNESS! With joy at the realization of what this could be like, my heart was broken at the love of God, the power of God and the promise of God to His children. If you do not know Jesus as your Savior, please don’t delay. Don’t wait any longer. Believe that He has come to pay the price for your sins, ask Him for forgiveness and tell Him that you want Him to guide you for the rest of your life. If you were to die today, how could you answer the question, "Oh, where, where have I gone?" I didn’t know who the man was. 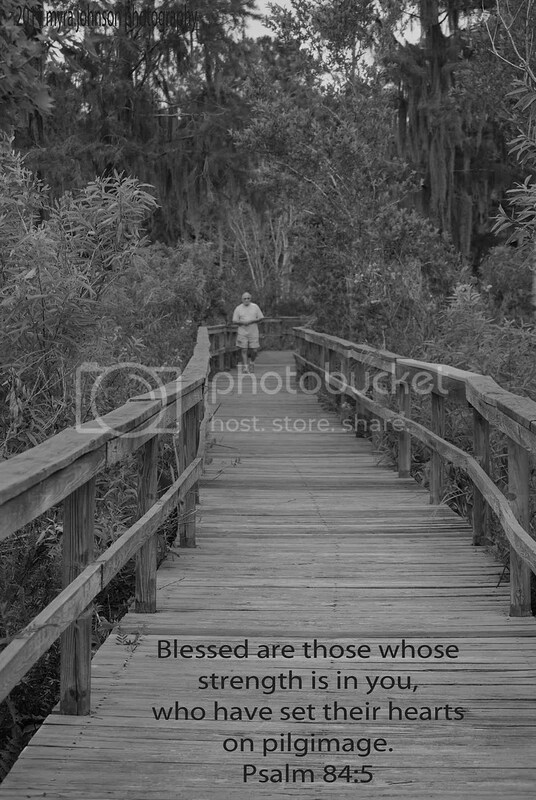 He was simply walking down the boardwalk to the secluded lake as I was walking away from it. We each had our own destinations. We had chosen our own way. There have been times in my life where I just wasn’t in the right place. I needed to get back to where I belonged, but it didn’t always happen immediately. This could apply to me in a spiritual sense, but what I am thinking of is an actual, physical place. As a child, I can remember being very seriously frightened while walking several city blocks at night as a thunderstorm was approaching. The lightning was flashing all around. I didn’t want to be out in the weather, but I had no choice that evening. Finally, I made it to my grandmother’s home. I made it there before the storm hit. Safe inside her house, I was completely relieved from my anxiety. I was with her. As an adult, I attended a funeral in another state. Grieving terribly over the loss, I was separated from my church family and close friends back home. I needed comfort only they could give. I yearned to be with them. I made the decision to leave quickly and return sooner. There are moments, hours—days even—that we find ourselves in a place that doesn’t feel right. We long for the place that is. Spiritually, there is a part of us that longs for God. If we make the decision to follow Him, we set our hearts on completing our journey of life as a pilgrimage. We spend the rest of our days following Him, moving toward a closer relationship. If we do not choose to follow God, all our places will never quite seem to be "right." The emptiness will still prevail. I realize that I am on a pathway toward God. Each step is down a more narrow walkway than is usually chosen. My heart is set on continuing. I know it’s going to be okay…. 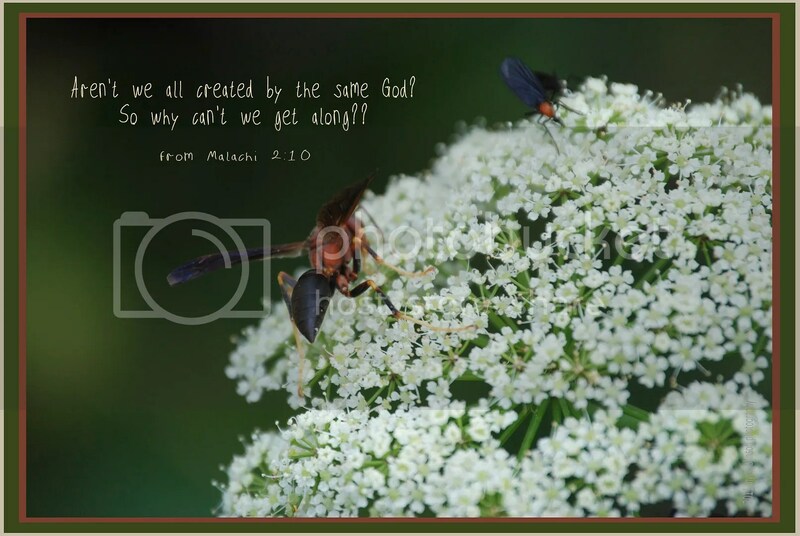 I photographed a wasp today crawling atop the bloom of a Queen Anne’s Lace plant. It wasn’t until I got home and looked at the image on my computer that I realized that the wasp had not been alone in his endeavor. Just a couple of wing spans away was a love bug–maybe two. I could just barely see the out of focus image that could’ve been its mate. When I think of wasps, I think of stings. It is necessary to take a wasp seriously. When disturbed, it goes on the defensive. 2. they get all over cars and seem to be almost impossble to remove. Going with my first thought about them, they get along well enough to fly together and they are not agressive. What a stark contrast to my thoughts on wasps! Now, I know that wasps seem to get along quite nicely with each other, even though they pose a real threat to humans. What is interesting to me about the photograph is the fact that they were all thoroughly content to explore the bloom together without incident. Passive, never-hurt-anybody bugs coupled with an agressive, be-careful-around-me, stinger-wielding wasp. If we happen to be the stinging type, couldn’t we just decide to put that on hold–one day at a time–and ask God to help us be kinder to those around us? If we happen to be the congenial, phlegmatic sort, couldn’t we step out of our comfort zone and at least try to relate to those somewhat, shall we say, confrontational people in our lives? Wouldn’t it be nice to just graze on the same flower every once in a while? Following God’s commands and loving each other—getting along with one another—is what we need to do…..